Camper Cabins are available at the Royal Gorge Campground, some find cabin camping more convenient at our campground while others enjoy tent camping in our campground's semi-secluded sites when available. Our campground offers full amenities like modern hot showers, a clubhouse, swimming pool, laundry facilities, community fire ring and more, always clean and well maintained. We pride ourselves on a manicured campground. The campground is a mile away from the Royal Gorge entrance, the Royal Gorge has the world's highest suspension bridge, the spectacular Royal Gorge itself, rock climbing, gold panning, whitewater rafting on the Arkansas River, and the historic Royal Gorge railroad train tour through the Royal Gorge. Our campground is on 50 acres, we offer plenty of activities in addition to quick access to the Royal Gorge. Campsites are scattered across a hillside with views of the Royal Gorge Bridge, and group camping (up to 70 campers) is available in our new group tenting area. Cabins are set away from the RV and scattered amongst the glamping tent area of our campground, giving privacy and seclusion. 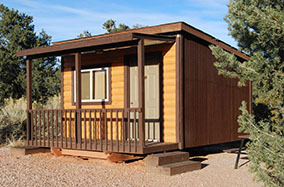 Cabins are secluded and come equipped with a full size bed and a set of bunk beds. Linens are not provided but are available for an additional fee. All cabins have air conditioning and a small table inside with a picnic table and fire ring outside. Most cabins have a view of the spectacular Royal Gorge Bridge, the bridge uniquely stands out at sunset from our campground, glowing from across the valley. We have a swimming pool, we host family reunions, our Royal Gorge campground is the finest and most modern in the Royal Gorge area. Interested in visiting the Royal Gorge in Colorado for cabin camping, glamping, or an RV park? The Royal Gorge Campground has all you could ask for.